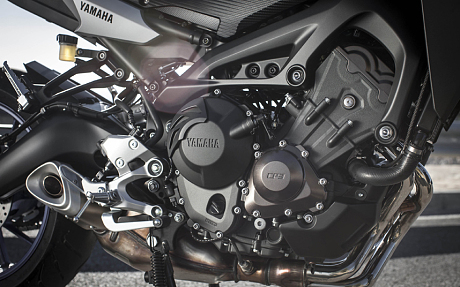 Yamaha MT-09, also known as the Yamaha FZ-09 in the North American market is Yamaha&apos;s first model to use 3-cylinder Crossplane engine, apply the most modern technologies in the motor current. 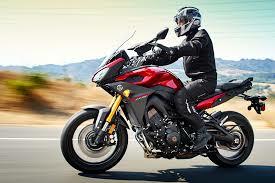 Here are motorbike reviews about Yamaha MT - 09. 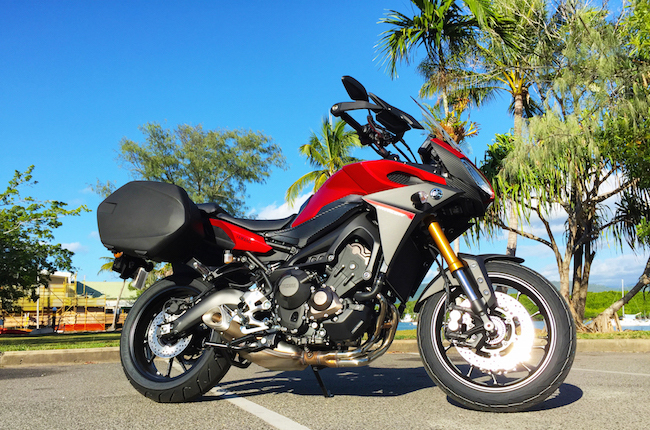 Criticism of the stock MT-09’s slightly soft forks has been addressed by increasing both the front and rear preload and damping rates on the new Tracer. As a result, the chassis just gets on with it. The ride is stable and plush enough; the steering sharper and lighter than most and even when pushing pretty hard through the snaking switchbacks and swervery in the mountains above Marbella, the suspension and brakes were never found wanting. In other words, if you wanna behave like a pillock, the Tracer will wheelie until the cows come home – it retains all the fun and zest of the base MT-09. If you wanna take the missus and a week’s worth of gear to St Tropez – AND have fun through the twisties on the way down – it’ll do that with ease too. And, come to think of it, if you want to just have a damn good, fun, truly all round motorcycle, the Tracer’s probably got virtually everyone beat. Compact and impressive ‘C3’ triple is essentially identical to that of the base MT-09 introduced earlier this year but with slightly revised and updated mapping to the different mode settings. From five thou the exhaust note changes, churning into that distinctive three cylinder wail that addicts and excites. If it rains, knock it into 95bhp ‘B’. And if you really want to thrash and scrape, ‘A’ mode adds a little sharpness to the response and meat to the midrange, enough to to have you snapping at the heels of all but the fastest super nakeds. Boy, I love triples. This is an affordably-priced machine – but it certainly doesn’t appear ‘cheap’. The fairing is cleverly comprised of lots of different ‘modules’ (rather than flat panels) and incorporates a variety of different, finishes. Screen is manually adjustable through 30mm via two tightening knobs inside the fairing (although it can’t be done on the move) plus there are adventure bike-style hand guards. It’s a well-specced, well-finished machine. 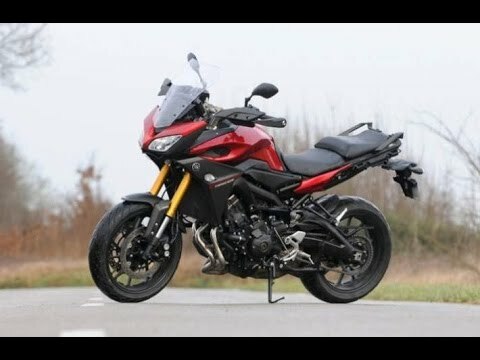 The new MT-09 Tracer will cost, if you hadn’t already heard, when first available in UK dealers not much over £8K. To put that in some kind of context, that’s over two grand less than Honda’s similarly-targetted new VFR800X Crossrunner, over £1500 less than Kawa’s updated Versys 1000 and 1850 squids under Suzuki’s fairly prosaic Vstrom 1000. And the new Yamaha’s probably faster, more fun and more versatile than all of ‘em, too. A new, stylish fairing and adjustable screen gives the MT weather protection to match most up to 1000cc; a wholly new, adjustable saddle and rear sub frame to match transforms it into a genuine two-up machine; while a bigger tank and uprated equipment (new, posher dash, centre stand etc) gives the Tracer the kind of long distance ability and class any credible sports-tourer demands.